Introduction Christmas is a time for celebrations, family gatherings and lots of happy memories, so I'm going to show you how to share your photos on the web in an interesting and stylish way that is not just a plain gallery of photos in lines and rows. Using Xara Web Designer it's easy to create photo pop-ups and photo slideshows so that just one click enlarges a thumbnail on your web page into a larger 'pop-up' version of the photo. 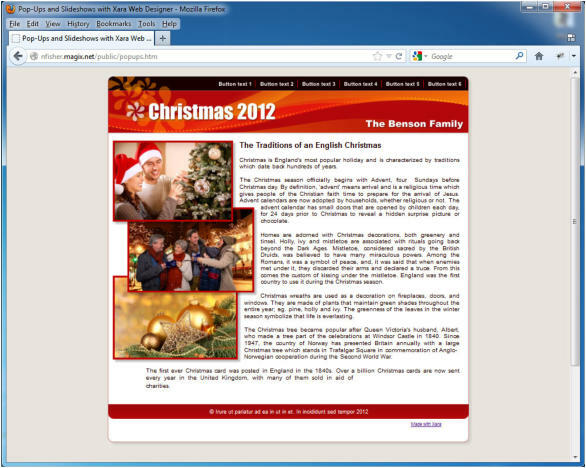 Your website visitor can also see a timed slideshow that they can browse through and pause as they wish. If you don't have Xara Web Designer, you can download a free trial version so you can experiment with creating your own web page. You can view the photos with pop-ups and slideshows in a web page here. So, now let’s start the tutorial!